Seen on the way to the lake. I would’ve given my right arm to travel about like this when I was a kid. 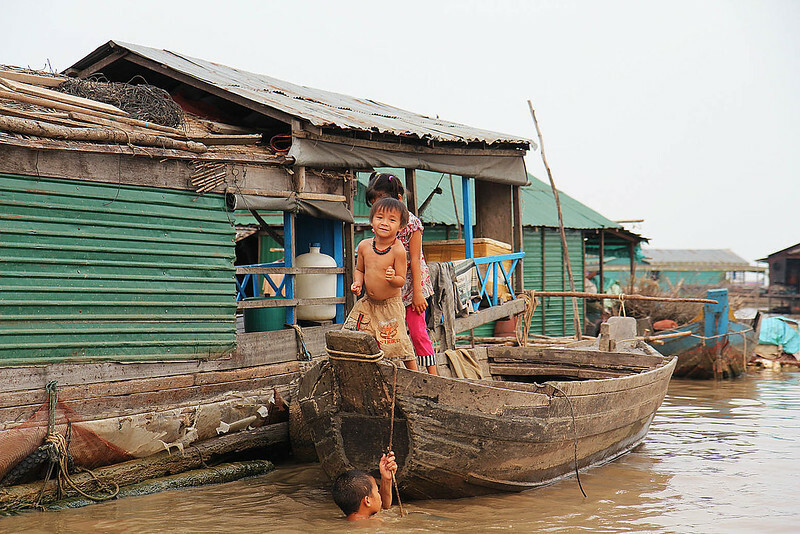 At about 4pm on Friday Ean picked us up from our hotel and we headed out to Tonlé Sap Lake. Now, I’m not sure what was going on in my head, but from somewhere I’d picked up a mental image of a lake with trees in it and blue water and … I don’t know… nice stuff. It really wasn’t like that at all. Houses on the way to the lake. Our driver lived quite close to here. They are on stilts because of the monsoon floods. We bought $20 US tickets from the dock about 30 minutes out of town. Imagine an open cut mine with some raggedy boats milling around. The water was milky-tea coloured and there wasn’t a tree (or anything green other than a toxic sludge around the water’s edge) evident anywhere. Somewhat unfortunately, we’d timed our visit for the end of the dry season. The lake is filled once a year by the monsoon to levels of 5 metres or more but for us it was more like half a metre. We saw a couple of boats being pushed out of the mud. There was a 20 minute ride along a narrow channel (strewn with garbage and shacks) to the lake. I was kind of wondering what we’d signed up for. Luke and I had one of the little boats to ourselves – us and to young men, one as pilot, the other as our guide. It turned out that only the pilot was paid, our guide did his job in the hope of a tip at the end. This boy jumped aboard to sell us coke and beer. That’s our guide in the background. When the channel emptied out into the lake we saw the floating village. Groups of dwellings, some looked a lot like regular wooden houses, others like boats with shacks perched on top. Our guide told us many interesting things about the people who lived there. Accommodation on the lake is free but dangerous. Hundreds of people die each year due to the monsoon storms. 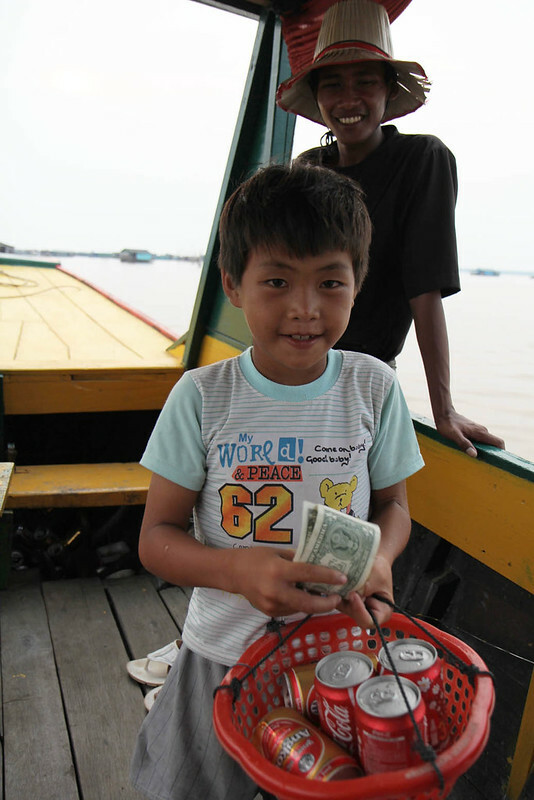 Our guide himself was orphaned at the age of 5 when his parents died in a fishing accident. 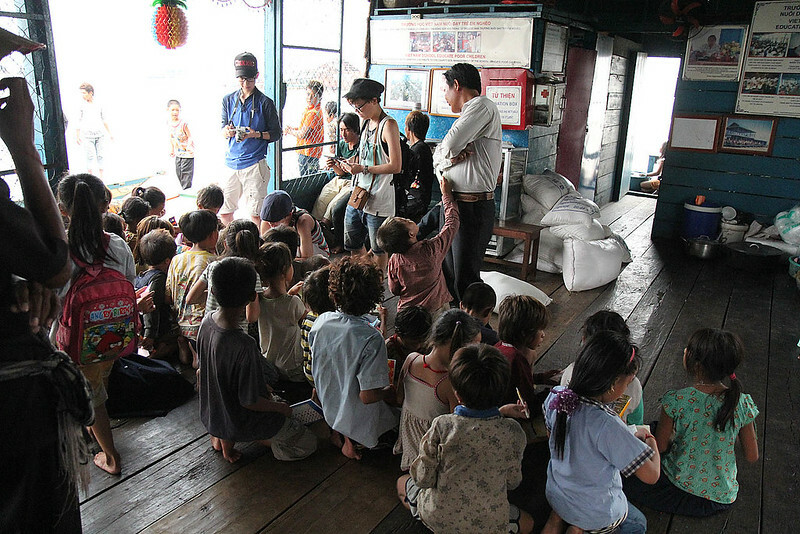 There are currently around 150 orphans living on the school boat and surviving on charity. The children here are some of the ones who live at the school. We bought a bag of rice to take over to the school from the co-op boat. When we got to the school they had quite a lot of rice already, if I’d known I would’ve preferred to take some fruit or vegetables, it seemed as though they lived on rice and fish most of the time. While we were at the school some Chinese people arrived and handed out books and lollies. I am not a fan of giving junk food to children in these situations. I can’t imagine the kids have toothbrushes or toothpaste to deal with this kind of diet and the wrappers from all the sweets get chucked in the water. The teachers at the school, if I understood correctly, work there for a week at a time for free and then rotate. It seems to be a pretty unstable arrangement but better, I suppose, than no school at all. The lake community, according to our guide, looks after each other though. And he said that he thinks they are happy – “poor but happy,” and they share their resources. This boy on the boat was dancing about and singing, much to everyone’s amusement. Reminded me very strongly of my nephew. It was quite heartbreaking to watch families using the lake water for swimming and drinking when sewerage clearly would be going straight into their environment untreated. The visit was… well, obviously not fun… but definitely interesting and eye-opening. I’m glad we went. On the boat ride back our guide and pilot brought a bag full of beers and shared them with Luke. They gave me a rather odd soya drink in a can. It was a bit like sweet, floury milk. We watched the hazy sun set from the prow of the boat and watched families go past, back to their floating homes. Ean was waiting for us at the dock and on the way back to Siem Reap he took us to his house. Even though he said I could bring my camera I felt a bit uncomfortable about taking photos. He lives with his wife and son and daughter in a one room cabin that is raised up off the ground. The village market seems to happen pretty much right outside his front door and he said the dust from the road often blows in. He had 3 dogs but now has 2 and fears someone took the one that is missing. Ean had lots of photos up on one wall, a tv and shelves of toys that belong to the kids. There was one bed that had a curtain around it. It seemed that often the kids slept there and he said he would sleep on the floor. Speaking of which, the floor in his house was the most beautiful wood. Dark and super shiny and smooth it was absolutely lovely to sit on and I told him about how I have a wooden floor at home but it is full of holes and nowhere near as nice. We had a drink and talked for a while before heading back to the hotel. It was sobering, realising what luxury we had to return to when there were people so close by who lived in fairly extreme poverty. That evening we met up with Kitty, a friend from Melbourne who is traveling around Asia with her 13 year old son. Turns out I thought I’d messaged her back last night and hadn’t – no wonder she didn’t turn up! Tonight I’d suggested we meet at ‘Butterflies’, a restaurant inside a butterfly enclosure. Now, because I am a certified genius, it did not occur to me until we got there that butterflies don’t fly around at night so we didn’t see a single one. Le sigh. Still, we had a great chat about Cambodia, compared travel stories and just generally enjoyed talking to people who weren’t the people we’d spent all day every day with. Kitty’s son Harvey particularly seemed to enjoy talking about gaming with (to?) Luke. Mums aren’t the best audience for that. Cambodia has certainly, in our short time here, been a positive, and learning, experience. If I could give any prospective travelers advice it would be to come in November/December. You’ll get a lot more out of the place when it isn’t nearing 40 degrees. I love these photos, I find these types of places so interesting. It really helping putting life back into perspective of whats really important.